The olive oil pressing at Pedruxella Gran always begins with the hunt for the mulo. He had spent the last ten months living in wild and splendid solitude on a rocky, olive tree-studded mountainside in the northeastern corner of Mallorca, and he was in no mood to be found. But traditional oil pressings need a cooperative mule to turn the millstone, and the season’s first crush at this ancient stone farm was no different. My hosts, Americans Liz Barratt Brown and Bos Dewey, had been feverishly picking olives all week, and now the guests had been invited and the food and wine bought, and expectations were high for the weekend’s pressing. But the mule was stubbornly missing. Olive oil crushes, or tafonas, as they are known in the dialect of this island off the eastern coast of Spain, are conducted throughout the Iberian peninsula from late October through March. It’s an extremely labor-intensive undertaking. While much olive harvesting is still done by hand, the pressings are now almost universally done mechanically. Manual tafonas like the ones the Deweys conduct at their sprawling finca (farm) are increasingly rare, and the press at Pedruxella is thought to be one of the few old presses still working on Mallorca. Inherited from Liz’s father, the farm’s main house surrounds two cobbled courtyards and contains a 13th century Moorish tower and the original olive pressing room. The property also includes a second house, a barn for the farm’s 200 ewes and their lambs, an organic vegetable garden, lemon groves, carob trees, stables and a dovecote which is home to seven black-tailed doves. And then there is the sweep of ruggedly beautiful land, 620 remote acres laced with ancient stone terraces, largely unarable save for the thousands of olive trees that cling to its rocky soil. Most of the present-day olive trees on Mallorca date from the 15th century, though local lore holds that many trees are much older, particularly in the Sierra Tramontana range where Pedruxella is located. “One of the trees on our finca is eight meters around the trunk,” said one guest who gathered later at the tafona, spreading his arms wide to show his tree’s girth. “They say it’s a thousand years old.” Perhaps. Olive trees are thought to have been brought to Spain by the Phoenicians some 3,000 years ago, again by the Greeks around 700-600 BCE and later by the Romans. When the Arabs arrived in Spain in the 8th century, they brought new varieties of olives. One of these varieties, empeltre, was eventually brought to Mallorca and grafted onto the Mallorquin trees, which were not fruit-bearing. The olives on Pedruxella come from these empeltre grafted trees. Even the nomenclature of the olive in Spain reveals its varied past. Mainland Spaniards call them “aceitunas”, a word derived from the Arabic al-zait, or “olive juice”; Mallorcans call them by their Latin name: “olivas”. No matter what you call them, harvesting olives requires hard labor. On the morning of the tafona, a dozen of us set off into the mountainside armed with buckets, bags, long poles and huge nets to surround the base of the trees. The olives are hard and green, and are brought down only by energetically thrashing the branches with poles, or by climbing into the gnarled trees and pulling them off by hand. The sun sweeps up into the autumn sky. We pick for several hours, then strip off our harvesting gloves and break for lunch, gazing into the Val d’en March valley as we pass around local meats and cheeses, and the island’s red wine. By the end of the afternoon, when the nets are all pulled up, we have collected about 150 kilos of olives. Stumbling over the ramshackle stone terraces, we haul bag upon bag of them back to the house and put them through a wooden tumbler, to separate the fruits from the leaves and twigs before the crushing. Once collected, olives must be pressed quickly to prevent them becoming rancid. The Deweys, who operate the farm following strict organic principles, press about 8,000 kilos of olives every year. The season always opens with a tafona at the house, to which friends and neighbors from across the island are invited. There will be two or three more pressings like it during the winter months, and several others at a small mechanical press in a nearby town. In a good season, the pressings yield some 1500 liters of oil. Because the Deweys shun nitrogen or pesticides used in conventional olive growing, their olives are more susceptible to pests and their oil production levels are significantly lower than those of non-organic producers. They do receive government subsidies for the care of the olive trees and for producing what is know here as “ecological oil”. But their costs are driven way up by the fact that they harvest in the mountains, from trees that can be very difficult to access. And somewhere out in those mountains is where the mulo has been hiding. On the morning of the tafona, after several days of searching, he is at last found and persuaded to come down the hill. As we drag our haul of olives into the pressing room, a farmhand leads in the mulo, his arrival announced by the clicking of his hoofs across the great stone courtyard. The sun begins to set, bathing the hills in soft evening light. Sheep graze on the terraces around the farm, their lambs bleating softly. By now, a fire is blazing in a massive sunken furnace that occupies the center of the pressing room. The finca’s head farmer, Tolo Benassar, stokes the fire from a pile of logs as guests drift into the great white-washed room. Above the furnace, a huge cauldron heating water to be used in the pressing sends billows of steam rising into the high, peaked ceiling of the room. To either side of the furnace is a massive 25-foot wooden beam attached to a 16-foot-high wooden screw that is weighted with a one-ton stone. These beams press the oil out of the olives. One bears the date 1833, although the pressing room itself is probably several hundred years older. At the back of the room, waiting for the mulo to step into his harness, is the ancient stone mill. The mule, wearing blinders to prevent him being frightened by the gathering, begins his slow loops around and around the track. As the olives are poured into a funnel above and drop down onto the round stone platform, the mule pulls the great millstone over them, crushing them to a brownish green mash, pits, skins and all. Now it is time for everyone to get their hands dirty. Tafonas are communal events. In times past, scores of villagers flocked to large oil-producing fincas like Pedruxella to help bring in the olive harvest. “We used to sing as we picked,” says an elderly guest, whose son, Rafael, has lent his mule harness for tonight’s tafona. “We would sing songs to tease the girls at Pedruxella Petite”—a farm below the Deweys’, but in easy vocal range in the silence of the hills. Our tafona has brought together its own varied group: a notary from Madrid, his wife and four children, a retired British army officer and his American journalist wife, a Spanish lawyer from a nearby town with his girlfriend, a Mallorcan bank director and her family, and a former Pan-Am pilot and his French mountain-climber wife, who proved to be our most productive olive pickers. An elderly real estate agent whose brother once farmed Pedruxella’s olives is also here helping out, as are a German musician, two families from the Dewey children’s local school, and a couple who once owned the New York restaurant Joanna. As the olive mash accumulates on the millstone, everyone gathers around to scoop it into large, flat wicker baskets, known as esportins, which look like berets. Dozens of these are passed hand to hand across the room, then stacked one by one under the pressing beam. As each esportin is added to the pile, Tolo, wearing a traditional leather apron for protection, adds a ladle of hot water from the cauldron to help bring the oil out of the olive mash. The temptation to taste the olive paste is irresistible—but disappointing. Freshly picked olives are intensely bitter and leave an acrid taste in the mouth. But the paste has other uses. “It’s excellent for your skin,” exclaim several women, slathering the sensuous mixture onto their arms and face. The stone floor of the pressing room warms up from the heat of the furnace. Liz circulates with a tray of small glasses and bottles of wine for the guests. When the stack of esportins is high enough, four volunteers move to the end of the beam and start turning the screw’s crossbars in a circle, slowly bringing the press down onto the pile of olive mash. As the pressure builds up, Tolo, Bos and several others prop up the stack of esportins with thick sticks, adjusting the rods constantly to stop the baskets from suddenly bulging out. Everyone watches in fascination: a moment of inattention at this juncture could send the entire stack flying across the room. Fortunately, the esportins stay neatly in place. 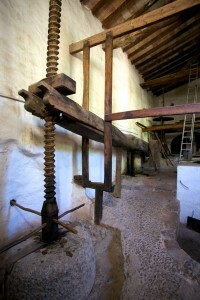 The beam is raised and lowered several times on the olive mash, to extract the maximum amount of oil. Rivulets of hot water and oil run glistening down the sides of the stack of baskets into a small channel under the floor of the pressing room and emerge into a vat just outside. Two friends who arrive with guitar and violin strike up Mallorcan melodies while the guests feast on local olives, jamon iberico and sheep’s milk cheese. Outside at the collecting vat, the water sinks to the bottom and the bright green olive oil rises to the top. A cry of “pa amb oli!” rises up among the gathering. This is the sacred moment of every olive pressing, the moment for Mallorca’s beloved bread and oil. Hastily, slices of crusty bread are scattered onto a grill and put on the embers in the furnace. Once they are toasted, we rub them with cloves of garlic and tomato-halves snatched from a heaping bowl. I join an eager procession out to the collecting vat, where we all dip our bread into the gleaming oil and add a sprinkling of salt. It is lusciously fruity and spicy, with a bitter note—the sign of oil made from olives picked early in the season. Then it is back to the pressing room to crank up the beam and bring it back down one last time. In all, we press 30 liters of oil that night, from the olives we picked during the day and 100 more kilos picked the day before. The guests dwindle away. The remaining slices of bread are dipped and eaten. As the last esportins are washed out, the last drops of olive oil skimmed out of the collecting vat and the embers in the furnace left to die down, we hear strains of violin music mingling with the ever-present tinkling of sheep’s bells on the hillside. In the courtyard, the last, lingering guest has taken up his violin and is standing under the stars and the cooing of the farm’s doves, eyes closed, playing quietly to himself. He finishes his melody, raises his bow in salutation, then turns and walks out of the great stone gate, into the dark night, and is gone.